Who can join Quest Express Boat Club? 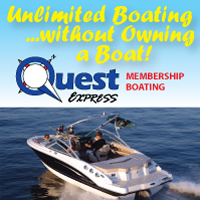 Do I need boating experience to join Quest Express Boat Club? How many people are included in a Membership plan? Can I call or reserve on the same day to get a boat? How do I know there will be a boat available? Are there any daily use charges? Can I take a boat out early or keep it out after hours? What do I do if I break down or have an emergency out on the water? Do I have to clean the boats? What types of boats will I have access to? Do I need boaters insurance? Who can join Quest Express Boat Club? Anyone who is 21 or older and has a valid Illinois Drivers license. Do I need boating experience to join Quest Express Boat Club? No, we provide orientation for all Club Members. We will guide you through the ins and outs of how to handle the boats, launching from the marina, and boating on the Illinois waterway. Quest Express is an excellent opportunity to learn how to handle different types of boats and decide whether or not you wish to become a boat owner. Can I bring guests with me? Of course you can! You are welcome to bring as many people as the boat you are using is rated for. How long does a Membership last? Memberships run for 365 days, making anytime of the year a good time to join (you'll always enjoy a full season for each year of your membership). How many people are included in a Membership plan? Each plan (Membership Agreement) provides for up to 2 Members to enjoy Club privileges. Members with Individual/Family plans must reside within the same household. The Buddy and Executive plans provide flexibility for friends or business associates to share a Membership plan. Only Members may make Club reservations or operate the Club boats. How do I make reservations? The Club provides an online reservation system. The system can be accessed any time that is convenient to you. Once you become a Member you are given a User Name and Password to access the system. You then select the boat style and date that you want and click to reserve. Reservations can be made from 2 hours to 30 days in advance. Can I call or reserve on the same day to get a boat? Yes, our Same Day feature allows you to do this, as long as a boat is available. We do request that you call at least two hours in advance of boarding, so that we can ensure availability and readiness of boats, and avoid unexpected wait time. Is there a limit to how often I can use the boats? No, there is no limit as long as a boat is available. How do I know there will be a boat available? Although you are not guaranteed a boat exactly when you may want it, the rolling reservation system and low Member/boat ratio allows equal access for all Members, and desired availability almost of the time (exceptions are quite rare). Quest Express adds more boats to the fleet as it adds Members, and maintains a Member-to-boat ratio that is much lower than the industry average. This means youll get more choice and more availability than with most other clubs. Are there any daily use charges? No. The only recurring costs other than membership fees are for fuel that you use. Concierge services such as catering or boat guide/coaching are available at additional fees if you want to entertain without the worries! Can I take a boat out early or keep it out after hours? Yes. Special arrangements may be made to get a boat early (morning sessions) or return after hours (afternoon sessions) please contact us so that we can help with this. What happens if I need to cancel? Cancellations are never a problem. However, the more advance notice you can give, the greater the chance that another Member can use the boat that day. What do I do if I break down or have an emergency out on the water? As a first step, contact Quest Express staff so that we can best advise depending on the circumstances, and provide/send assistance as needed. In addition, dont be afraid to ask other boaters for help theyre usually very willing to oblige. Do I have to clean the boats? Club staff handles regular maintenance and detailing as needed, but we do ask that Members take their trash and leave boat interiors in wiped down condition after each use. It only takes a few minutes and it keeps the boats looking nice for all Members. Where can I boat? Due to the length of time it may take to get through the locks, boat use is allowed within the Ottawa pool only. This pool is the area between the Marseilles Lock and the Starved Rock Lock. This includes 14 miles of beautiful boating, with islands, restaurants, spots for anchoring or rafting, scenic Buffalo Rock, Heritage Harbor Marina, and complimentary Ottawa city docks. Do you offer boat training classes? There are many Coast Guard-approved courses offered in the area and online. For example, Quest Watersports allows the Coast Guard to reserve its facility every Spring for refresher and new boater training. As a Member, you are not required to complete this training, however Quest Express encourages these courses, and reserves the right to require them at a later time if warranted. Quest Express will provide an orientation to operating the boats and to Heritage Harbor Marina. We want our Members to have a great time and part of that is making sure you have the knowledge you need enjoy your day on the water. Should you desire additional coaching, this may be arranged and customized for additional charge. What types of boats will I have access to? There is something for everyone! Quest Express offers a range of size and different types of boats, so whether you want to go fishing, tubing or just cruising for the day with a large group, we have the boat for you. Members choose the boat they need when they are making reservations. Are the boats well maintained? Absolutely. All boats are continually inspected and maintained by qualified Quest staff. All U.S. Coast Guard-required safety equipment including life jackets are kept on board each boat. Quest Express also provides anchors, lines and any bumpers needed. Do I need boaters insurance? No. Quest Express maintains a Club policy that covers major damage and liability. Are corporate Memberships available? We do offer an Executive Membership. If you would like to add more Members to your plan or customize a Membership, please give us a call to discuss your unique needs. Concierge services available such as catered lunch and a packed cooler - just say the word! How do I sign up? Just call us! Well set a time to tour the marina, see the fleet, review the Membership Agreement, schedule your orientation and get you out the water!! !